​May 23rd, Full concert, 2x45 minutes!!! June 30th, starting already 13:30!!! Oh NO! Doug was already booked elsewhere (probably a cruise) when we were invited to Beatle Week in Liverpool and therefore he cannot join us! So we decided to top the band for BW2018! Olle Bengtsson of Pepperland, and Phil Evans from The Overtures!!!! Both of them are VERY well known from main events during Beatle Week and here in Sweden, and both of them have played with the Bertils...but never at the same time!!! Hope to see you all on Beatle week! ​FOR INFORMATION ABOUT BEATLE WEEK 2018, CLICK HERE! Hosting Pre-party (Förfest) Before Beatle Day in Gothenburg. With cool guests! More info click here! Shyte, I forgot to enter this event in advance. Sold out anyway. 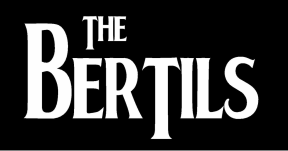 The Bertils played in different constallations, including "Classic" with Bosse Hedman, Lpool 2014 version with Stefan Fredrickson and with guests stars Olle Bengtsson from Pepperland and Phil Evans of the Overtures. See pics under "Pics". We were invited to play at The 50th anniversary of Beatles first trip to the USA. It took place place in New York City last February. Unfortunately some of us (Read: Kent) was at that date somewhere in Asia, so it did not happen. Also, the band was invited to Musikfest in the metropolis of Hjo, in July, but we are spread all over at that time. On Mars 1st the band played at a private birthday party. The great thing with this one is that Bosse Hedman played 4 songs with us as Guest Star! By the end of August the band will have 4 gigs on Beatel Weel in Liverpool. See above! Private party in Sälen with original members and friends. The Bertils are invited to Beatle Day at Trädgår'n Göteborg, towards the end of October.